I decided that I’d try an installation of a current version of an ERP software product (Sage 300 ERP) on an “old” version of Windows Server (just 2008 R2, mind you). I’d forgotten about all the updates. Hours later…I can finally try once again to install Microsoft SQL Server. 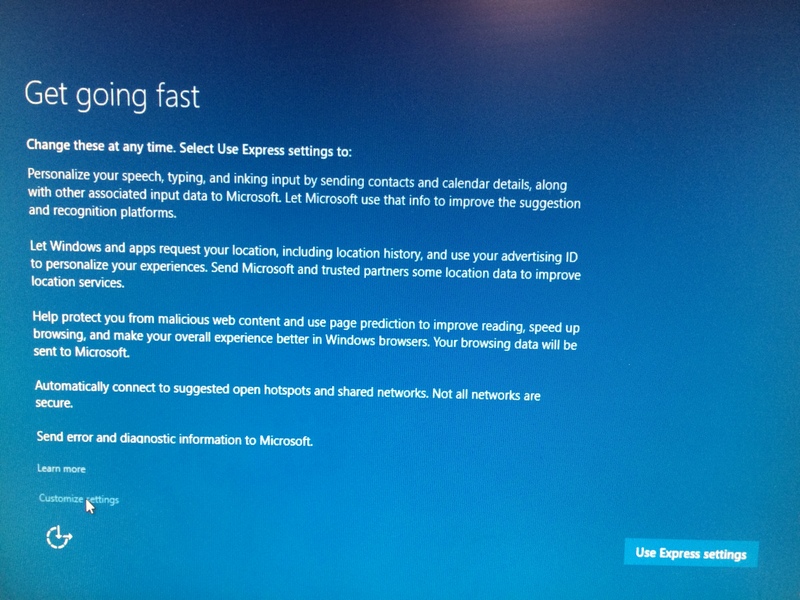 When Windows 8 came out, we warned you to take a look at the default installation options, and possibly not to choose the Express installation. You can read that post here. Notice that you get a somewhat sketchy description of what Express Settings are going to choose in your behalf. Sorry, by the way, for the quality here. I had to snap these with my cell phone since I was installing on the primary machine, not a virtual. Also notice that the “Use Express Settings” is a nice big, inviting button while the “Customize Settings” is a somewhat less appealing blue in a smaller font than the rest of the page. I took the Customize settings route. I’m not going to comment on those questions, because I didn’t look up the specifics. The wording itself is enough to put me off. 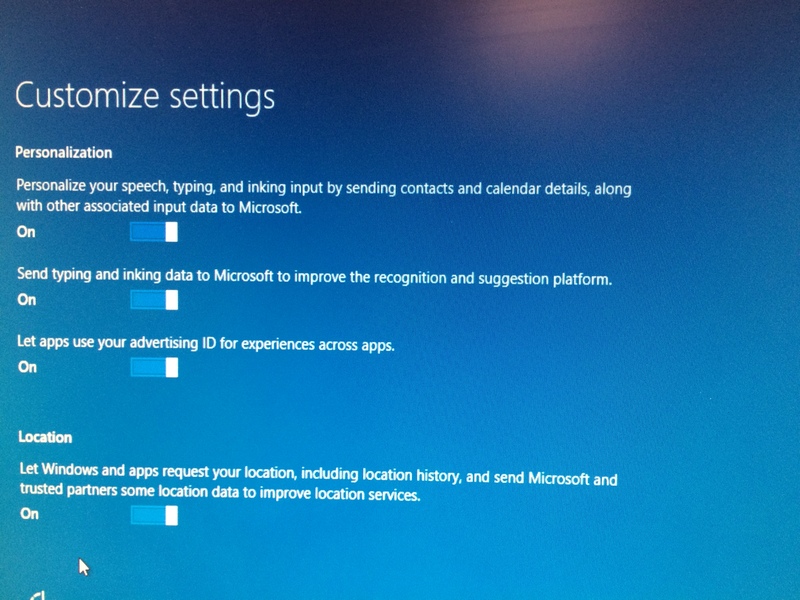 Do I really want to send speech, typing, and inking data to Microsoft? Everything I say to Cortana, write with a pen on the screen of the tablet, and type at the keyboard? Off. Off. Off. Off. Ok. So it’s your call as to whether you turn this stuff on. A little too much like Big Brother to me. 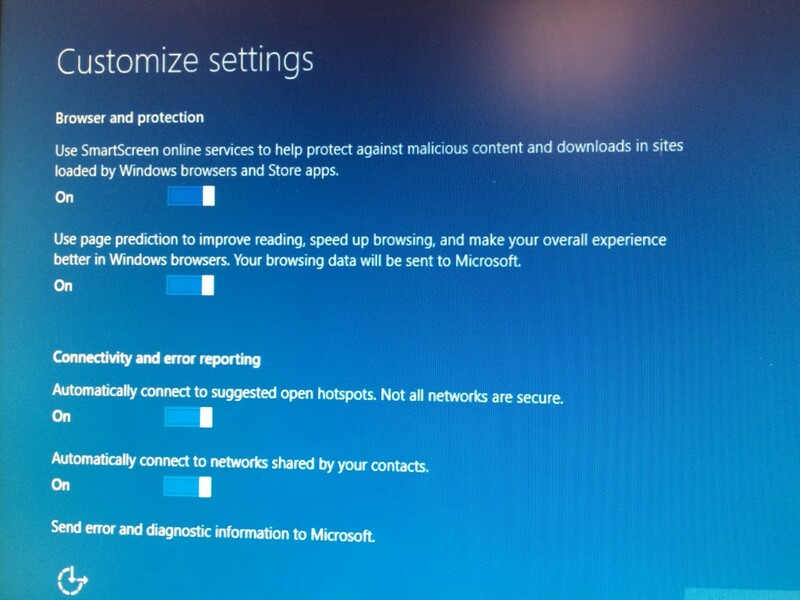 Microsoft, you’ll just have to live without my personal information. Sorry to disappoint. I want to review a product that we’ve tested over the last few weeks. Several years ago we–like many other companies–moved everything to a virtual machine. The phone system is the only thing that still runs on a physical box. Everything else is virtual. And I like it that way. I won’t go into the virtues of virtual machines, but for several years, they’ve been the way most businesses have gone. But there has been a problem with our implementation of VMs: backup. That’s not to say that there are not several products in the market that back up virtual machines, but there’s not a good solution (in my opinion) built into the Windows Server operating system. And most of the alternatives that come from third parties are very expensive for a small business. Enter Veeam. I found it via internet search; my motivation was that one of our old servers that was running some non-critical virtual machines died. I had backups, but they weren’t the most recent, and it got me to searching for a better solution. Enter Veeam. I installed the Essentials version, and set up backups of the machines I had. Veeam does both. With job recording and an easy console. I won’t belabor the point. I had to restore a 40Gb web server today. It took 10 minutes. Less time than I had already spent troubleshooting. And it was before the 30 day trial version ran out. Send me the real thing!